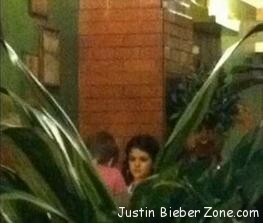 Justin Bieber spotted having dinner with Selena Gomez in Indonesia. Jelena spotted together in the Soekarno Hatta Airport in Indonesia. Upon arrival, the couple went to a local restaurant, where he was photographed by fans. Justin Bieber is performing tonight, April 23, 2011, at 8pm local time in Sentul Jakarta, Indonesia. Wow I really hate Selena Gomez!! And I love Lacey schwimmer, chelsie Hightower, and I love justin bieber the most out of all of them! I love u Lacey schwimmer!! CONE ON GUYS !! STOP SAYING THESE THING !! THEY WANT TO BE TOGETHER WHO ARE U TO ASK THEM TO DO WHAT UR JUST A FAN THATS IT !! U CANT BE HIS GIRLFRIEND WHY U DONT WANT TO ACCEPT THIS ?! WE ARE IN REAL WORLD NOT A DREAM OR STORY !!! HE WONT BE UR BOYFRIEND !! LET HIM BE WITH HIS GIRLFRIEND!! THEY WANT TO HAVE FUN LET THEM HAVE THAT ! NO ITS NOT !! HE IS HAPPY SO ITS THE BEST DAY ! CANT U SEE HIM ?! So, Justin bieber is my biggest celebrity crush, i absolutely love him! His voice is gorgeous and hes so sweet! But everytime i want to find out recent news about him all i hear about is Jelena. It’s getting kind of annoying. I love selena and i have nothing against their relationship because i know ill never date him, but Justin always says that hes just dating girls trying to find out who he is. But selena and him dont really act like thier just dating. They act really serious and committed.I guess i just miss the cute flirty attitude he used to have towards his fans when he wasnt in such a serious relationship. But theres nothing we can really do to stop them. Yeah he barely even hugs his fans or says I love you anymore. And it’s getting kind of annoying because i love it when he says I love you to his fans. but i guess Selena isn’t that bad but i really miss the old Justin. at least Selena makes him happy but any other belieber can make him happy too.Love ya Justin!!! I <3 Justin Bieber !!!! the fact about me is that i am never gonna support any of justin relationships! i dont expect myself to be his girlfren or anything but right now justin’s my biggest crush! he has everything i want in a guy…i dont just like him because he’s famous or because he’s hot but i like him because he’s a great guy with a big heart! if u say your biggest crush kissing another girl…how would u feel? well thats how i feel! i liked selena b4 but then i heard abt the long list of guys that she dated when they became famous and i didnt like her anumore. its just me…i will never change and i dont want to! i wont ever like justins girlfriend! and i support justin and not his girlfrens! i support his music and i adore HIS talent! this is just my thought so dont hate on me for what i say! : i dont know if selena is using justin but what i know is that justin likes her…it doesnt seem like she likes him bcuz everytime they’re being photographed together, she hides her face! and i thought she said that he was cute and hes like her little bro…what happened to that?! i would never date my lil bro! and plus i think that selena needs a man and justin needs a girl! selena is a woman! Selena is using him! EVER Bieber fan NEEDS TO SEE THAT! She dates all the guy that are popular. Look, she dated Taylor from Twilight she date Carmon from All star Weekend when they were popular, she date Nick from the Jonas Brothers, and now she has Justin! She’s almost a gold-digger. Selena needs a punch in the face from one of Justin Bieber’s and tell her that she is just using him. Hey Justin wat up can I ask u a question do u still watch dancing with the stars if you do who do you think will win this year ! And Justin please reply back ok bye ! Your such a poser.. I got by the name Justin BIEBER not Justin! justin bieber and selena gomez r going on dinner date that so sweet<3: they look so cute together . At this point, the only thing we can do is pray and ask that God will give him the discernment to understand this. It’s almost like he puts Selena before God and he spoke earlier about not doing this. YOU ARE RIGHT…. JUSTIN NEEDS SOME MORE GUIDENCE FROM GOD. I JUST WANT HIM TO BE HAPPIE. fans indonesia very crazy with YOU JUSTIN! SHE IS JUST USING HIM FOR THE PUBLICITY!! SHE COMMENTED THAT HE WAS LIKE A WEE BROTHER I KNOW I WOULDN’T DATE MY WEE BROTHER :O! “its all about publicity ” so there are also “many” pictures of the two on their Southeast Asia tour. The two are at present just their short time of togetherness. YOU are right she is just using justin bieber,she is a “FAMEUSER”…………..
ok to all the belibers who want to date him: if he dates a fan there will be other fans pissed if he dates Selena or other celeb there will be again the fans pissed. who ever he dates he wont be able to pleasure you all. if you wait all your life after him you will end up lonely raising 20 cats!!! there maybe a line of guys waiting for you and you only have your eyes on Justin. thous guys wont wait forever. we all know there is 1% that he falls in love with a fan. but if you see it no celebrity has fallen for a fan. second: Selena is not using him. they first started as friends and ended up falling for each other!!! it was just Destiny. who knows maybe this relationship will not last long or maybe it will. Maybe it will be Just for eyer or maybe forever. But if the hate continues it wont last. why??? Because Selena cant take it. Maybe Justin is in love with her and Selena with him. What happens if they brake up??? Justin may even stop singing!!! the paparazzi are giving him hard time. when he became this Celebrity he lost privacy honesty and more. i think that he needs a little brake. I totally agree with you, sometimes people can never understand that things can’t always turn out the way they want it. But Justin did say that he would date a fan…..I mean there’s thousands of girls he can to choose from, but there can only be one, which would cause chaos and hatred. Selena would never use JB for anything neither would anyone else. Lastly, Justin & Selena really need some privacy wether it’s the paparazzi or even the fans. i agree with you guys…if you love justin you will love whoever he love..
Not all of his fans stand by roadsides holding placards that say I want to marry him. Many understand that frankly, its great to see him on the stage and listen to his music on their mp3’s but really, they don’t want to have to live with him. He has about 9.5 million twitterers now. Let’s say they are all fans. 4.5 are the insane ones, who do want to marry him, etc. Subtract them. 5 million left. About 3 million are children in the strictest since of the word. Subtract them. That’s 2 million who just enjoy your music but oddly find themselves concerned about him dating this one person. If 2 million intuitive women mostly, are telling him they have this concern, doesn’t he think that maybe he should take this statistical fact in some way, into account. Doesn’t he at least at 17 think that he should have choices for the oh, 5 years of his life at least. Normally, I would not say you should listen to your fans in this matter, but this seems to be a situation where your fans are just trying to tell you something and they themselves do not seem to be able to NOT say something. In the meantime, all, we should continue to pray for Justin that he will have discernment about this and to ask himself if he is or is not, putting this very relationship, before God. LETS FORM A REBELLION ! We should all pray and ask that God will give him the discernment to understand this. It’s almost like he puts Selena before God and he spoke earlier about not doing this. So,i can only one that is SAD .! yep….i’m a great beliber , but i’m in sri lanka…and i don’t have money too.but i hope he will someday come too sri lanaka…selena is sooooo lucky girl!AYU BIEBER don’t worry..
Selena is such a lucky girl!!! I wish I was here cause I love jb so much! <3 she is soooooo lucky, but I do feel sorry for jb cause he has like no privacy anymore! <3 u jb! romantic couple oh my Gob JB ! I’am so sad cauze,can’t watch JB concert ‘! I want to DEAD now’! NO SWEETIE JUST BE HAPPIE THAT UR ALIVE. ITZ NOT EVEN THAT SERIOUS. SELENA IS JUST SOME GIRL, AND ONCE JUSTIN OPENS HIZ EYES, HE WILL REALIZE (JUSTIN… I’M SPEAKING MY MIND) THAT HE IS WAYYYY TO GOOD FOR HER. GIRLS JUST COME AND GO. MAINLY T GIRLS. I love how justin and selena, have there intimate time alone. they need to have that intimate alone time to spend with each other. they can reconnect with each other. justin and selena need time alone together as a couple. justin can’t imagine his life without her in it.hopefully justin and selena can spend time alone this year and also his bday on a intimate level. How does jUstin not realize that Selena’s obviously using him for his fame?! How long have they been dating, what almost 5 and a half months and he hasn’t realized yet? He is way too good and a girl like Selena doesn’t deserve him! I kind of realize that he hasn’t realized that she dated stars like Nick Jonas and Taylor Lautner for their fame yet because he was pretty new to being famous at that time. Selena is such a gold digger!!! Didn’t Justin say that he wanted a girl that wouldn’t use him for his fame? Then why hasn’t he realized?! I am soooooo upset! I agree totally. At this point, the only thing we can do is pray and ask that God will give him the discernment to understand this. It’s almost like he puts Selena before God and he spoke earlier about not doing this. “its all about publicity” so there are also “many” pictures of the two on their Southeast Asia tour. you are definitely right she is just using justin bieber FAME and MONEY “SHE IS FAMEUSER and A GOLD DIGGER”i think she made justin blind because of her fake love,i hate her soo much,her song WHO SAYS is become number1 because of justin bieber.one day justin weak up everything he has are allready gone and that fame user take everything. hope justin really see the truth. Yeah i agree with you all cause she has dated all the big stars…. Justin Bieber Diners at the restaurant where? yeah .. its, here.. is Indonesia ..
and today, is “THE SADEEST DAY” In The Erath !! i cant meet his concert in my country! !